Tomorrow is my friend's birthday, and her present is finished! I made her a light, lacy infinity scarf. I used a super fine (category 1) yarn and a size E/4 (3.5 mm) hook. The yarn that I used is Cria Lace by Knit One Crochet Too; it's a blend of 65% fine alpaca and 35% Tencel. The scarf is very light and airy in texture. You can see the stitch that I used in my previous post. I had a bit of the same yarn left, so I also made a rose (from this pattern) and swirls (simply a chain of desired length, then 5 double crochets in each chain) to decorate the gift wrap. I secured a pin to the back of the flower, so it can be worn as a brooch too. Here is a beautiful, open stitch that can be used for summer tops, shawls, or other crochet projects. I used super fine (category 1) yarn, and a size D (3.25 mm) hook to make the sample shown in the picture. Row 1: dc in 4th ch from hook , *ch 5, skip next 4 ch, sc in next ch, ch 5, skip next 4 ch, 3 dc in next ch* across, ending with 2 dc in last ch. Row 2: ch 3, turn, dc in next dc, *ch 5, sc in next sc, ch 5, dc in next 3 dc* across, ending with dc in last 2 dc. Row 3: ch 2, turn, dc in next dc, *ch 5, dc in next sc, ch 5, dc3-tog over next 3 dc* across, ending with dc2-tog over last 2 dc. Row 4: ch 1, turn, sc in same beginning stitch, *ch 5, 3 dc in next dc, ch 5, sc in next dc3-tog* across, ending with sc in last dc2-tog. Row 5: ch 1, turn, sc in same beginning stitch, *ch 5, dc in next 3 dc, ch 5, sc in next sc* across, ending with sc in last sc. Row 6: ch 8, turn, *dc3-tog over next 3 dc, ch 5, dc in next sc, ch 5* across, ending with dc in last sc. Row 7: ch 3, turn, dc in same beginning stitch, *ch 5, sc in next dc3-tog, ch 5, 3 dc in next dc* across, ending with 2 dc in 3rd ch (counting from bottom) of ch-8. Repeat Rows 2-7 for the pattern. I now made a baby hat to match the White Lace Blanket. It's very simple, featuring the same open stitch in the front. I also have an idea for a baby dress with the same stitch, but I'm already working on another two projects. These days I simply cannot stop crocheting. And it's the rain to blame! It's been pouring here in Northern California for days now! Which is good, of course, as we've been experiencing drought for too long. My favorite place to crochet right now is on my bay window. This is the only place in the house that offers enough natural light for crocheting. I use my mom's Czech crystal vase as a yarn bowl. When I saw it at her place, I was like: Hah, this would be perfect for keeping my yarn ball! Works great! It's nice to stay inside, crochet, daydream, and watch the rain behind my window! I feel so proud and accomplished that I completed this blanket. I made it in less than a week. Sometimes when inspiration hits, I just can't stop crocheting/creating. It didn't go all smooth. I struggled with the border and had to do some frogging. But at the second attempt, I was able to figure out the right stitch count to make the border symmetric. The finished blanket measures about 37 by 31 inches. The skill level is beginner. I used Snuggly Wuggly Big yarn, which is one of my favorite yarns for baby blankets, and a size G/6 (4.25 mm) hook. The pattern is available in my Etsy shop. I will be adding this pattern to Ravelry and Craftsy shortly too. Dear bloging friends, followers, and random visitors! Thank you for your visits, comments, feedback, and all the support in 2016! 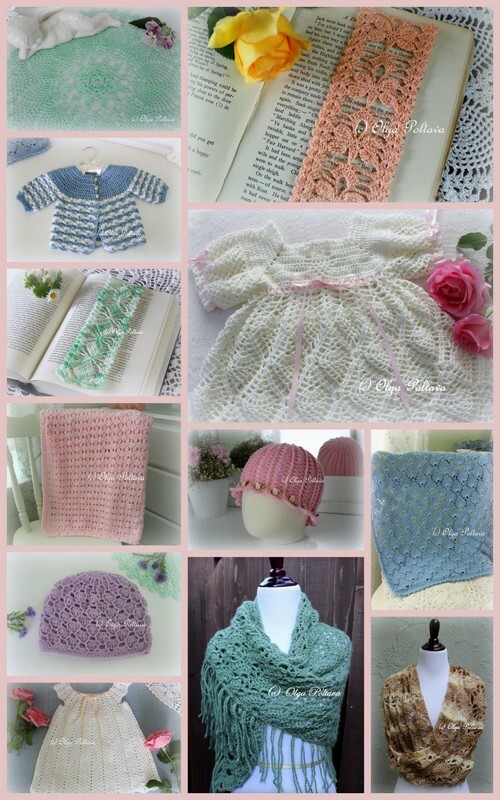 I wish you a wonderful New Year filled with creativity and lots of crochet projects!